Foul Play in Uthiru | Hujambo! I’ve been working at the International Livestock Research Institute (ILRI) in Kenya for about a year and a half now. The institute is a fine place and all—big campus, green grass, fast Internet, smart people doing good science, lots to learn, etc—but it couldn’t be situated in a worse place (Uthiru). In the words of the security guard in my apartment complex: “Everyone in Uthiru is a thief” (he lives next door, in Kawangware). Uthiru, just outside the Nairobi city limits, is just like any other small town in Kenya I suppose. Lots of people riding bikes, a roundabout with people playing music and dancing, a good fish and chips joint, etc. I ride in and out regularly during daylight hours with no problems. As the darkness approaches, however, the story changes. I don’t make a habit of leaving work late, but the atmosphere is much different as the evening moves on after about 7 pm. Unless you’re a criminal or a police officer, you probably don’t want to be in Uthiru after dark! 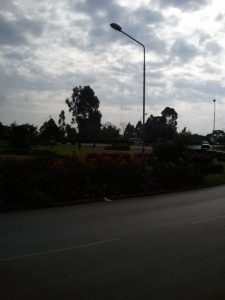 Something I’ve been meaning to write about for some time are the street lights at the Uthiru roundabout, just up the road from ILRI. I can’t remember if they were ever working, but a few months ago I noticed that the power wire had been disconnected and was dangling from each of the lights! I snapped a picture at the time because I thought it was funny (and SO appropriate for the Uthiru I’ve come to know). I cracked up last week when I noticed that the lights themselves had actually been removed from the top of the poles. At the time I thought, “Well now that’s daring!” and figured that the local criminals had upped their game a notch. Then, just this week I noticed that the poles too had been removed! I still think Uthiru’s a terrible place to be after dark, but I think this might be a little far fetched to pin on some local criminals! Kenya Power and Lighting (KPLC), perhaps? I went to college at Kabete campus in the 80’s so I know the area. It was much saner then, just a typical small town, and we often got our hair did in the salons there on occasion.The population has probably exploded since, hence the craziness but when ILRI was built it was out in mashambani…. At least they did last time I was there last week. The lights work in Uthiru in general, but at the roundabout there aren’t any anymore! The lower roundabout as you go from Uthiru madukani down to Kawangware. There used to be lots of car jackings and gun shots there, but last year they got a new OCS and I heard he don’t take no crap so he shot all the criminals!